One little-followed method for forecasting stock market moves is the Dow Theory, which originated with Charles Dow, co-founder of the Dow Jones & Company and The Wall Street Journal. Although Dow Theory covers several aspects of stock trading and investing, is it now signaling a top in stocks? 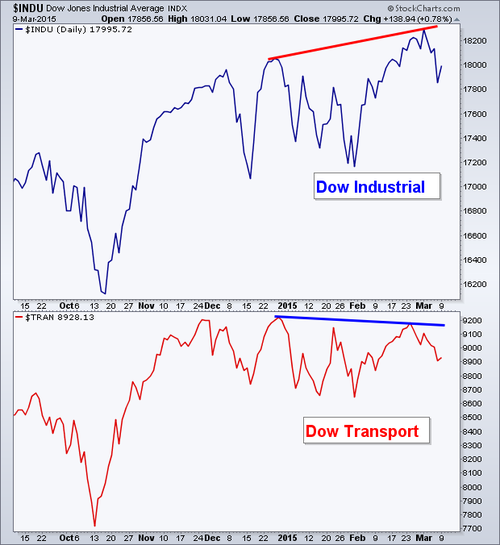 According to Dow Theory, a top is put in when either the Industrials index or the Transportation index hits a new high but the other fails to confirm (hit a new high also). Although the Industrials have made several new highs in recent months, the Transportation index last made a new high December 29, 2014. What is most interesting is that the price of oil has been more than cut in half in the last nine months, and fuel is one of the major costs for transportation companies. Lower fuel costs have added to the profits of companies that make up the Transportation index, yet it has failed to reach a new high in the last three months. Whether or not Dow Theory is saying that stocks are topping, according to many metrics stocks are trading at very dangerously high levels. Moving from highly-valued assets to low-valued assets is a time proven method for building wealth. Now is the time to consider selling some stocks and buying gold and silver, both of which are selling at bargain basement prices.